It’s seems incredible, but it has been 10 years to the day since September 11, 2001. Those of us old enough to be aware, have had a great deal of time to contemplate the events that unfolded that day. Among those who watched the events of 9/11 unfold in real time, right before their eyes, were many of my fellow architects and engineers. Thanks to increasingly powerful Information Technology, we have been able to watch the three World Trade Center towers crumbling to dust, in excruciating slow motion detail, again and again. Closer scrutiny of the events of 9/11 in the 10 years since has led many of us to some disturbing but unavoidable conclusions. One of these conclusions is that the WTC1, WTC2, and WTC7 towers could only have been brought down deliberately and with premeditation, by means of controlled demolition. Modern steel high-rise buildings engulfed in flames may twist and bend out of shape. But they never spontaneously and miraculously disintegrate into thousands of fragments. They never fall straight down at free fall velocity inside their own footprints. A modern steel high-rise building will disintegrate into thousands of fragments and fall straight down at free fall velocity inside its own footprint, only if it has been subjected to controlled demolition. Only if thousands of cutting charges have been strategically placed and precisely detonated in close succession. As one critic of the official explanation of the events of 9/11 put it, in wryly roundabout fashion, “No building exhibiting all the characteristics of a controlled demolition, has ever not been a controlled demolition.” In other words, if it looks like a controlled demolition, it is a controlled demolition. 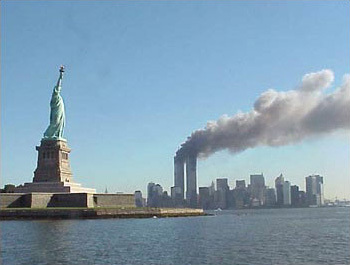 The WTC1 and WTC2 towers were struck by aircraft. The WTC7 tower was not. Yet all three towers disintegrated into thousands of fragments and fell straight down at free fall velocity inside their own footprints. The aircraft strikes did not cause the three WTC towers to disintegrate. The fires did not cause the three WTC towers to disintegrate. The combination of aircraft strikes and fires did not cause the three WTC towers to disintegrate. The three WTC towers disintegrated as a result of controlled demolitions. The aircraft strikes provided superficially plausible “causes” for the controlled demolitions. Most Americans, however cynical and jaded, cannot bring themselves to believe that “our” government would ever murder 3,000 of its own citizens, with premeditation and in cold blood. Initially I assumed 9/11 was a case of what Chalmers Johnson called “blowback,” retaliation for black ops carried out abroad without the knowledge of the American public. I assumed that at worst it was a case of LIHOP, or “Let it happen on purpose.” I assumed that key elements within our own government learned of the attacks in advance, but deliberately lowered America’s defenses to ensure that the hijacked flights would not be intercepted. I temporarily set aside my incredulity over the “Pancake Collapse Theory,” even though everything I knew about architecture and structural engineering screamed that it couldn’t possibly be the explanation. Like millions of other fellow citizens, I could not believe “our” government could commit such a horrendous atrocity. Therefore I turned elsewhere for answers. Eventually however, the knowledge that modern steel high-rise buildings do not suddenly and miraculously disintegrate into thousands of fragments and fall straight down at free fall velocity, forced its way back into my consciousness. Intractable architectural and structural engineering realities eventually forced me to conclude that 9/11 could only have been a case of MIHOP, or “Made it happen on purpose.” I was forced to conclude that key elements within “our” government probably planned the attacks. They carried them out, either on their own or with al-Qaeda, then framed al-Qaeda for them afterwards. A controlled demolition is a unique and distinctive process. Nothing looks like a controlled demolition except a controlled demolition. If something looks like a controlled demolition, it is a controlled demolition. The destruction of the three WTC towers looked like controlled demolitions, because they were controlled demolitions. The “Pancake Collapse Theory,” promoted by FEMA, PBS, and Popular Mechanics, which purports to explain the destruction of the three WTC towers on 9/11, is riddled with lies and deception. An objective scientific investigation of the events of 9/11 is essential. The American people have a right to the truth. People the world over have a right to to the truth. N.B. : Some 9/11 Truth Movement figures may be government plants whose function is to discredit the 9/11 Truth Movement by advancing arguments that turn out to be non-credible. The only way not to be taken in is to connect the dots for yourself. Evaluate each argument for yourself, on its own merits, independently of who is advancing them.